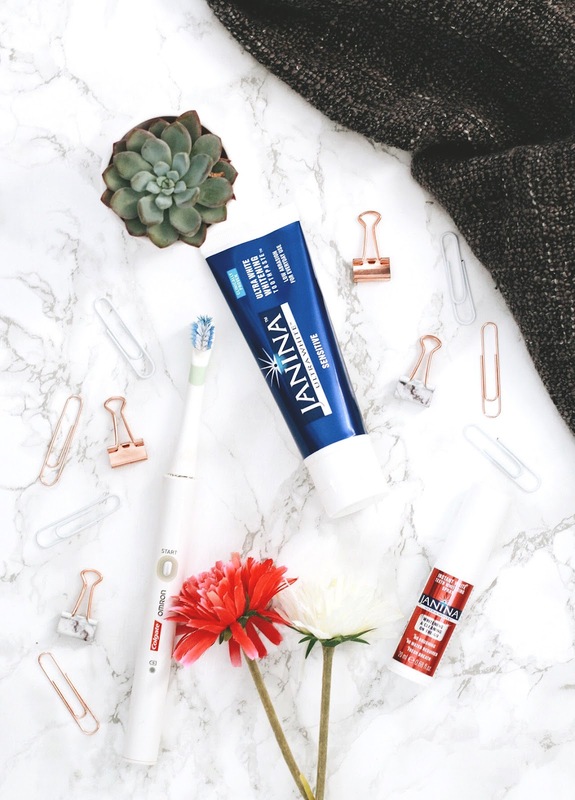 Teeth whitening is something I’ve been contemplating doing for a while now, but have never known where to start with all these different products on the market! Its actually National Smile Month right now, so what better time to start attempting to whiten my teeth? I’m someone who never smiles with their teeth, mainly because I seem to have a wonky smile. So, I stick to just smiling without showing any teeth haha. I’d love to change this, because it’d be nice to show off my pearly whites! This is where Janina come in handy. They’ve let me try two of their teeth whitening products, and I’m so excited about it. The first product I got to try was their Sensitive Tooth Paste*. As someone who suffers with sensitivity, this could not be more perfect. Janina don’t use anything too harsh in their products, but instead use natural enzymes from papaya and pineapple to promote low abrasion whitening results. This is really reassuring, as a lot of teeth whitening products scare me away with the chemicals they put in them! Its nice to know that you’re whitening your teeth the more natural way. So how have I found this? Well, I’ve been really enjoying using it. Its suggested you use this for a little over two minutes, without rinsing your mouth out with water afterwards. This will help to give you the best results! I’ve been using this for almost two weeks now, and I can actually see a slight difference already. I’m not gonna lie, I did (do) have quite yellowy teeth, well not like super yellow but they certainly aren’t as white as they should be. This has really helped to lift away that yellowness and has given me a lil bit of a brighter smile already. The second product I’ve been testing out, is the Instant White Teeth Whitening Spray*. This is such a cool idea. Its basically an on the go teeth whitening spray, so you can top up and refresh yourself whenever you feel its necessary. Its great to pop in your handbag and carry around with you on a daily basis, and if you feel you need that little bit of freshness, you can just give this a spray and you’re good to go. All you need to do is spray this in your mouth, swish it around and you’re done. No water needed. Perfect for any of you busy bees out there! Overall, I’ve really been enjoying using both of these products and will probably keep you updated on my Twitter with how I’m getting on! Have you tried teeth whitening before?